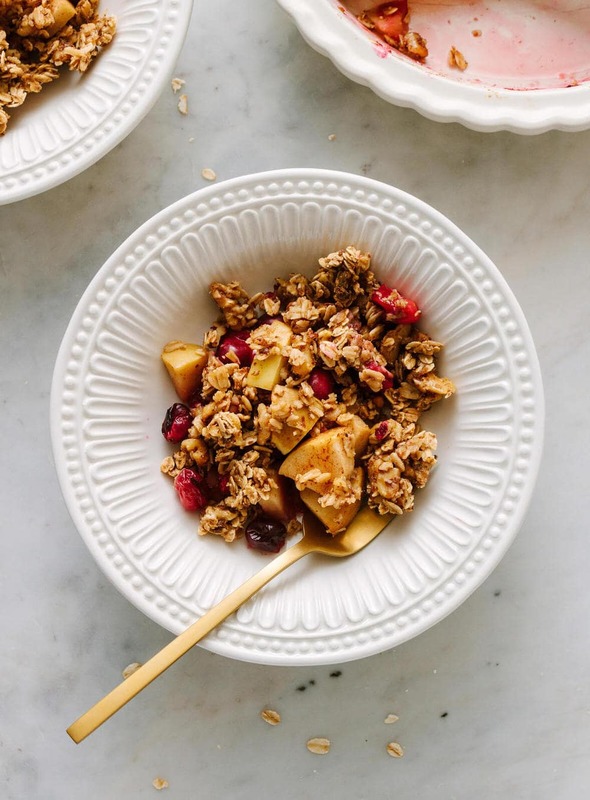 This vegan Apple-Cranberry Crisp recipe is made with fresh cranberries, with an oat crumble topping that’s naturally sweetened with pure maple syrup and spiced with cinnamon, and is so easy to make, healthy and delicious. The apples bake up tender, the cranberries soft and juicy, and the topping is crisp, crumbly and flavorful! Now, let’s talk more about this delicious fruit crisp! 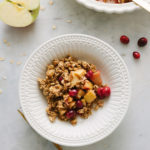 Adapted from my Healthy Rustic Apple & Pear Crisp in the TSV archives, it’s has all the same wonderful flavors with a bit of color and tartness from the cranberries. It’s been my go-to crisp and hasn’t failed me yet. It doesn’t involve a lot of steps and is so simple to make, which is why I love it! 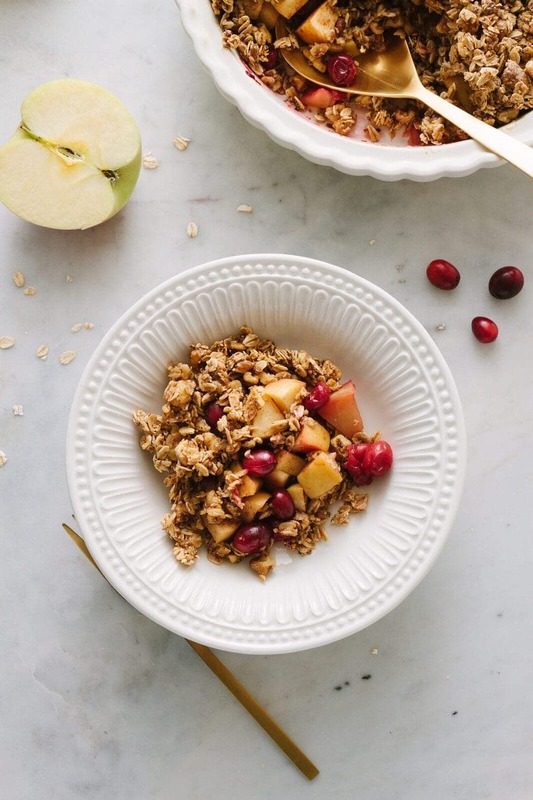 I might also add that this vegan Apple-Cranberry Crisp isn’t just for dessert either, and is healthy enough to start your morning, snack on during the day, or even have for a light lunch! Apples: I’ve used Fuji apples here because 1.) they are my favorite and 2.) I thought the sweetness of Fuji apples would be a good compliment to the tartness of the cranberries. Feel free to use your favorite apple, even tart green apples would be wonderful! Cranberries: Fresh, beautiful cranberries are best, but frozen will work too! Crumble Topping: Rolled and/or quick oats will be the base of the topping and mixed with pure maple syrup, flaxseed meal or almond meal, cinnamon and vanilla. To make this gluten-free, use certified gluten-free oat. There is an option for walnuts or pecans, I’ve included walnuts in the topping you see here. They add texture, but if you’re going for low-fat, omit them. 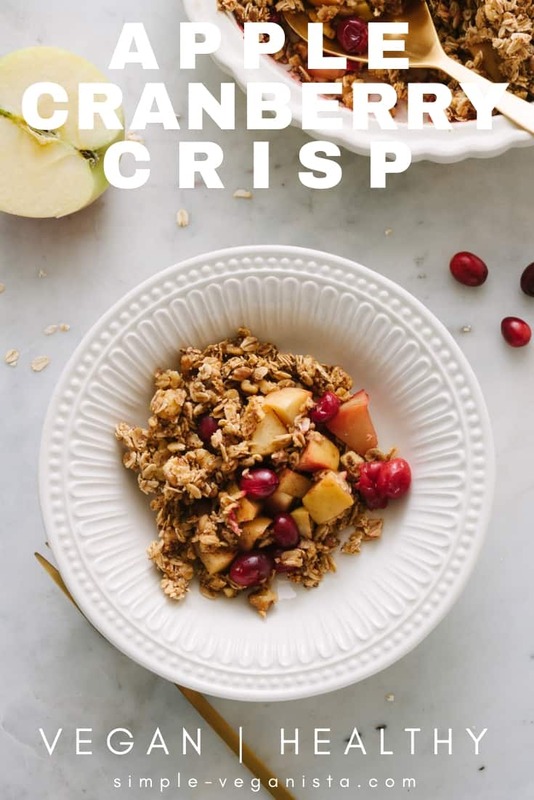 I’ve also adapted this crisp to be optionally oil-free, the maple syrup in the oat topping is enough to crisp it up perfectly (topping shown here is oil-free)! If using oil, the oil will yield a slightly less dry topping. Put the fruit together: Wash, slice, core and dice the apples, into about 3/4 inch pieces. 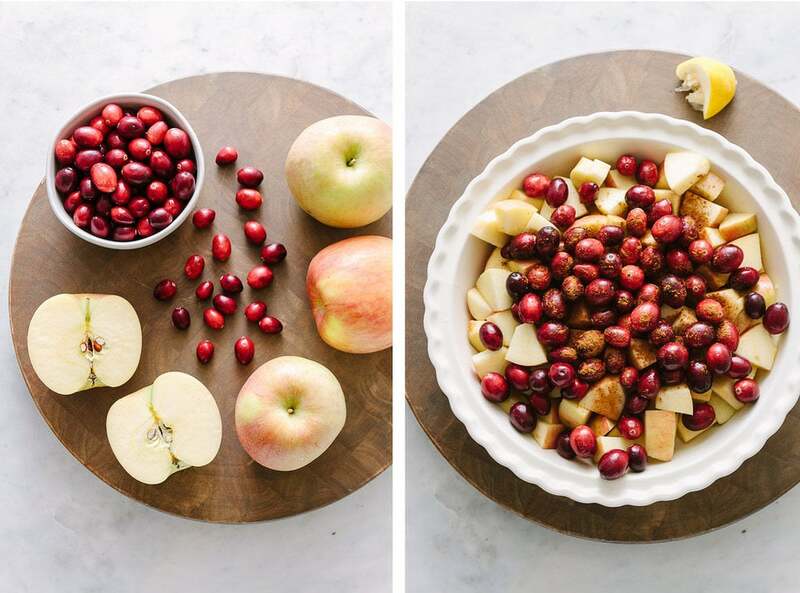 Combine apples, cranberries, lemon juice, sugar and cinnamon. Mix well and layer into a 9 x 9 baking dish, you can also use an oval shaped dish. Make the topping: In a mixing bowl (shown above), combine oats, flaxseed meal, walnuts/pecans, maple syrup, optional coconut oil (mine is oil-free), vanilla and salt, mix well. Please taste test as much as you like, the topping is delicious! Spread oat mixture evenly over the apple and cranberries (shown below), and sprinkle with a little more cinnamon of you like. Bake, in preheated oven at 350 degrees F., for 35 – 40 minutes or until apples and cranberries are fork tender. Towards the end of cooking, about 20 – 25 minutes in, keep an eye on the topping, if its getting to dark, cover loosely with foil (nothing worse than a burnt crisp). Once done, let cool 5 – 10 minutes before serving. Serve warm as is, with a scoop of non-diary vanilla ice cream or dollop of whipped coconut cream. Store leftovers in the refrigerator for up to 5 days. 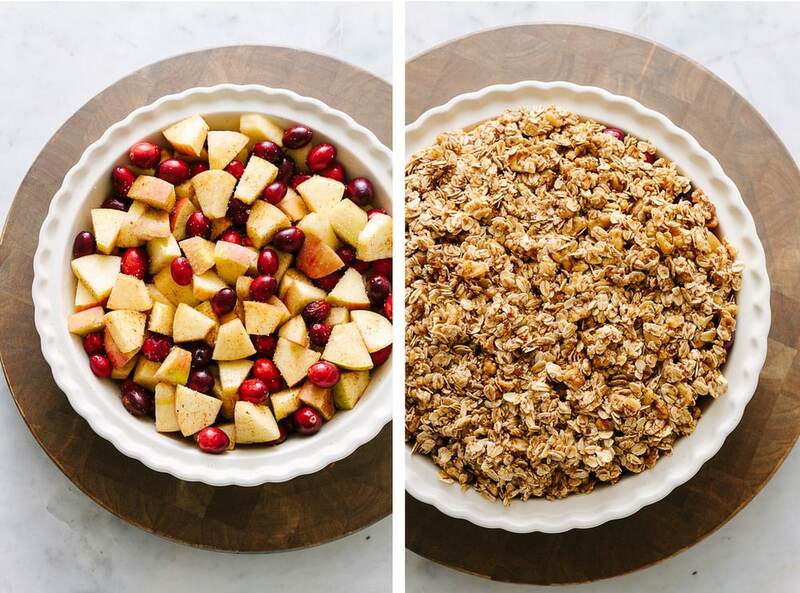 And that’s it, apple-cranberry crisp made simple and easy! Can I make a fruit crisp ahead? Yes! Simply prepare the crisp as directed, let cool completely, cover and store in the refrigerator until ready. 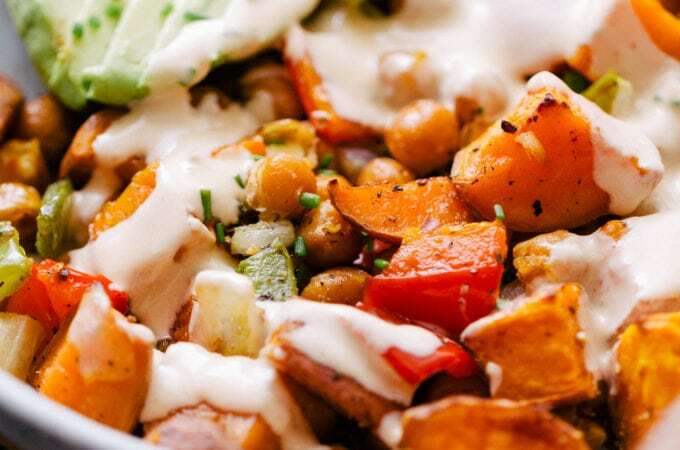 To reheat, place in a preheated oven at 350 degrees F. for 15 – 20 minutes, be sure to cover loosely with foil so the crumble top doesn’t burn while reheating. Nothing better than baked goods from the oven with warm fruit. 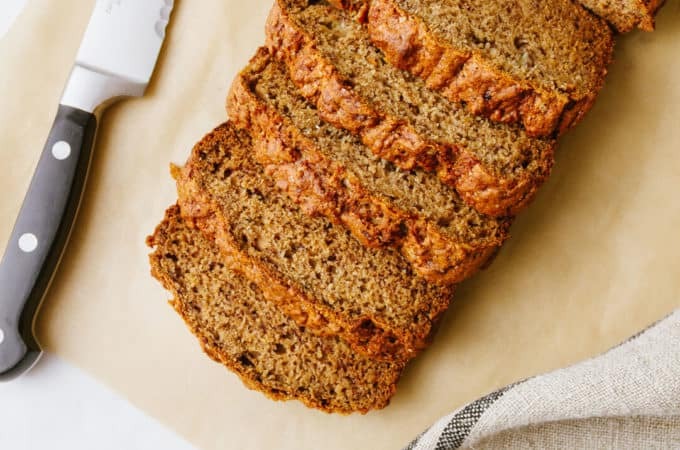 These delicious dessert style recipes are healthy enough to be eaten for breakfast or as a snack. Enjoy! 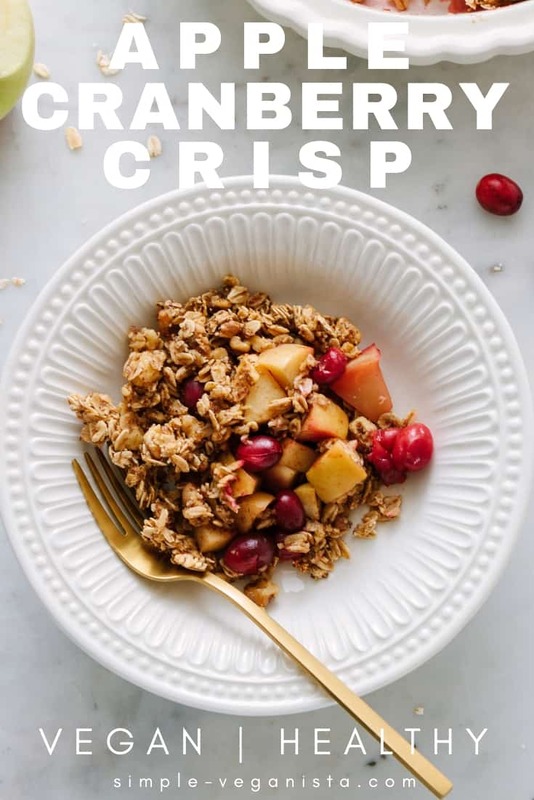 Made with fresh apples and cranberries with a crumbly, crisp oat topping naturally sweetened with pure maple syrup, this fruit crisp is easy, healthy and delicious! 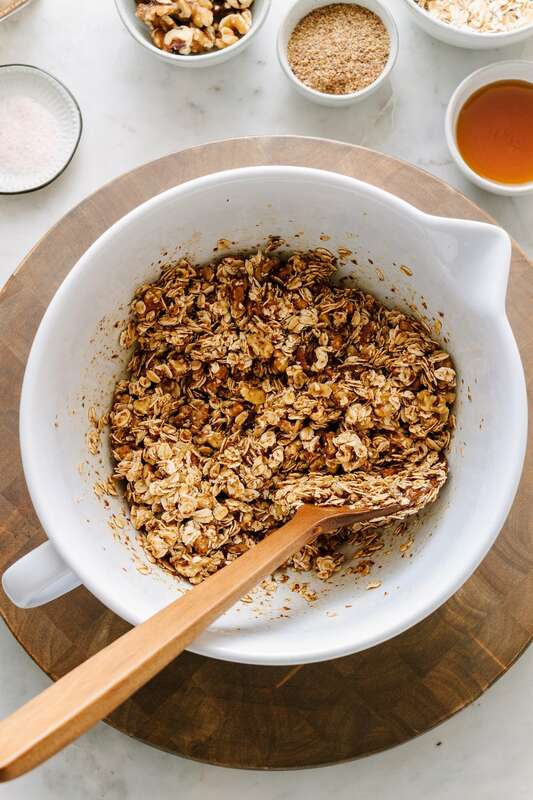 Make the topping: In a mixing bowl (shown above), combine oats, flaxseed meal, walnuts/pecans, maple syrup, optional coconut oil (mine is oil-free), vanilla and salt, mix well. Spread oat mixture evenly over the apple and cranberries (shown below), and sprinkle with a little more cinnamon of you like. Bake for 35 – 40 minutes, or until apples and cranberries are fork tender. Towards the end of cooking, about 20 – 25 minutes in, keep an eye on the topping, if its getting to dark, cover loosely with foil (nothing worse than a burnt crisp). Once done, let cool 5 – 10 minutes before serving. 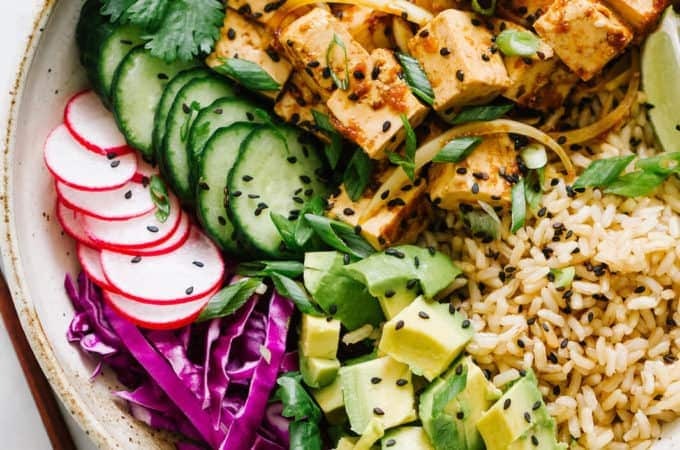 Make gluten-free by using gluten-free oats. Feel free to use almonds, pecans or other nuts and seeds of choice in place of the walnuts. Peel your apples if you prefer. I leave the skin on for the fiber and less work. Plus I love the rustic look and different colors the skin brings to the dish. If serving for everyday I don’t bother to peel the apples but if serving for company I may consider peeling them. 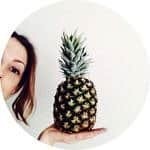 Make this oil free and omit the coconut oil. Your crisp top will be a little bit dryer, but still good! Nutritional information does not include the optional ingredients. Off to buy my first bag of cranberries this season! Yes, getting a late start but this recipe has changed that! Might be the snow predicted for tomorrow (or the mouth watering photos) that makes recipe this just perfect for today. Thanks!